All of us see Heart healthy foods assembled on huge shelves while shopping at grocery stores, but we all prefer to pick food that looks delicious, yummy and tempting to eyes... I also often do so, but after reading an article about fat foods on a women health page WebMD , I started to prefer good healthy meals over fat foods. Those luring treats can be damaging to health, specially refined carbohydrates are must to avoid because these are the root cause of many dangerous diseases. I have extracted some key information from that article for you people to compare by yourself, check below the listed items and see where you are about to play with your health. Low-fat popcorn is crunchy, delicious, and a source of whole grain fiber. Plus, you can enjoy a large, filling portion! Look for popcorn made with "94% Fat Free Butter" or air-popped popcorn. 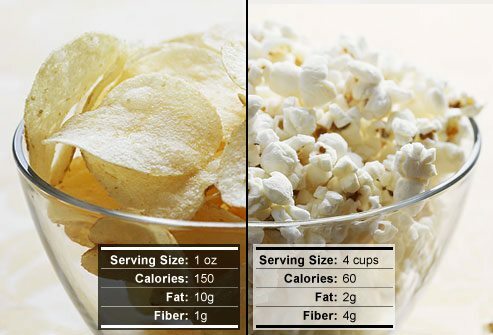 Potato chips are high in fat and it's hard to eat just a few -- all that you get in a 1-ounce serving. If you love chips, go for the baked ones and watch your portion size. 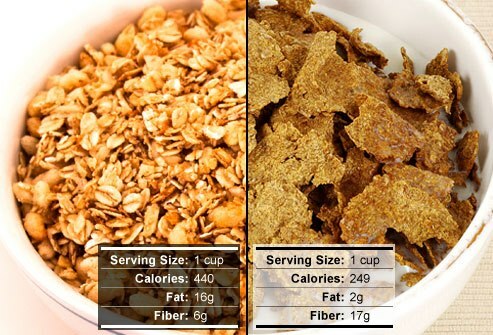 For a nourishing start to your day, choose a whole-grain bran cereal packed with fiber, such as bran flakes. Add fruit and low-fat milk for the most nutritious beginning. Granola may be natural but it's often high in fat. Use granola sparingly or as a topper on low-fat yogurt. 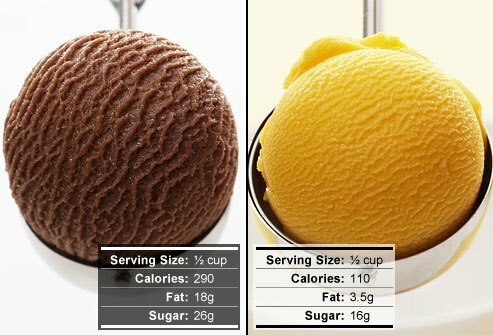 Choose sorbets, sherbets, light ice creams, or frozen yogurts for a fraction of the fat and calories. Thanks to a new special churning technology, these frozen treats taste like rich and creamy premium ice cream. A ½ cup dessert can fit into everyone's diet. Enjoy thin-crust frozen pizza Margarita style, or with grilled chicken or veggies. 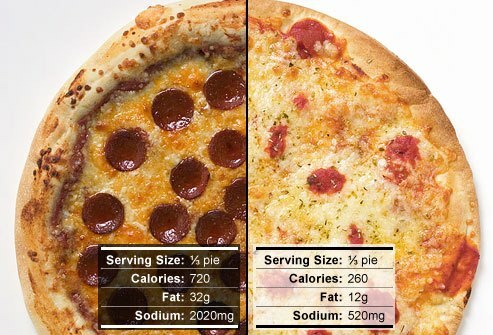 By passing on the sausage, pepperoni, and extra cheese, you'll slash the fat, sodium, and calories in this favorite food. Limit your portion to two slices (of a 12-inch pizza) and add a filling side salad to complete the meal. Hummus is a gratifying combination of nutrition when paired with fresh veggies like baby carrots or baked pita chips. Made from chick peas, hummus is a good source of iron, vitamin C, protein, and fiber. 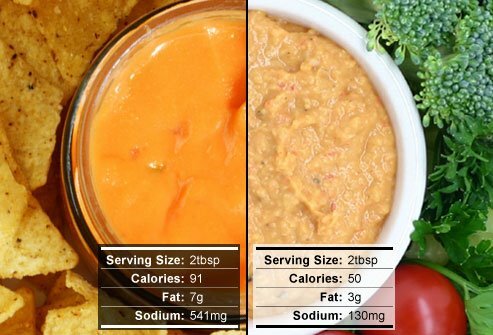 So enjoy the pleasing taste of hummus and skip the cheese dip that can lead to diet sabotage. 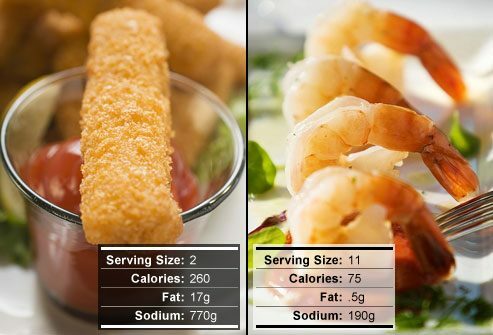 Shrimp are a tastier and healthier alternative to breaded fish sticks. You can buy them already cooked and shelled. Eat them cold with cocktail sauce, grill them, or sauté with veggies in a stir-fry. Try the new whole-wheat pasta blends. Even the kids will like it if you top the spaghetti with your favorite tomato sauce. Voila! You’ve turned a childhood favorite into a high-fiber and nutrient-rich dish. 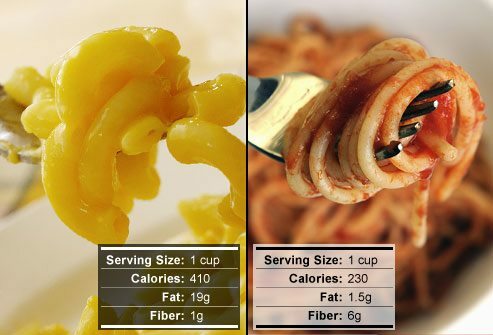 Macaroni and cheese may be an old-standby, but it’s low in fiber and loaded with fat and calories. Frozen Meals Can Be Healthy, Too! Look for frozen meals that feature lean protein, plenty of vegetables, whole grains, and a low-fat or simple sauce. Avoid fried frozen food, or creamy casseroles. 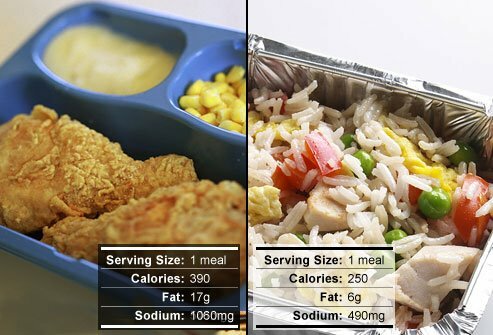 Frozen meals that are baked, grilled, steamed, or sautéed are healthier and lower in calories. 100% fruit juices are naturally rich in vitamins, minerals, and disease-fighting antioxidants. In fact, they're the next best thing to eating whole fruit. 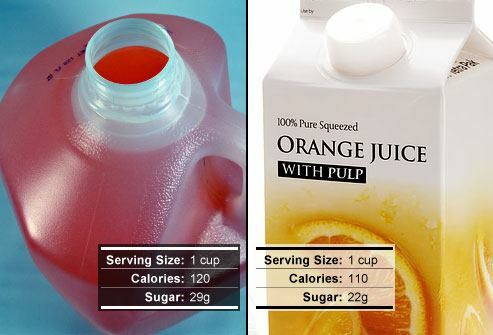 "Fruit juice drinks," however, are usually packed with sugar and empty calorie.